No, no Disney damsel in distress narrative here at all. I’d heard an excerpt from the Phillip Adams interview the night before so I was well aware that Kevin Rudd was going to stop sitting around in a sulk with the ALP logo erased from his placards and join the campaign properly, once he was physically up to it. As in, join the campaign. Like one of the merry band on the road to Mordor. But our news media chose to describe Rudd’s return through the lens of … Male White Hero returns to Rescue Damsel in Distress. With a side serve of We Knew a Sheila wouldn’t be Up to the Job. Move outa the way, Gillard, and let the men do this properly. Tools getting you down? I know the feeling. I didn’t put those images together – that was on the same page as the article headed “Ex-PM Rudd to PM Gillard: I will save you” by Michelle Grattan and Michael Gordon. Was a disgruntled subeditor making a veiled comment there? If they still have any, that is. And was there any evidence that Rudd actually said anything about “saving” anyone? There isn’t any in the article. But the actual journalists were all on song about the White Knight Rescue narrative. …Move over Julia. Kevin’s here to help. …Rudd looked positively prime ministerial when he spoke yesterday. It’s the ultimate girl-meets boy encounter…His place or hers? …the woman who grabbed his job from him. There’s more, but I’d really like to keep this nice Sunday dinner down. So, Gillard can’t win. If Labor wins the election it’ll be “she couldn’t do it without Kevin10!1!”. If she loses, well, a chick just wasn’t up to it. Headzup to the Oz media. You’ve already been called repeatedly on your crap (non) reporting. And I’m not Robinson Crusoe with my disillusionment and anger. Shape up, please, before we end up with this. I think your smashing this week has been, you know, smashing. Thanks Pav. And that was an excellent guest post. Hope there’s many more. I love the advert on the right that says, “Tools to help women”. I am too shocked to comment. 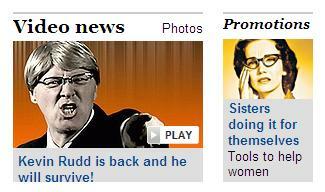 Still in mental seizure over seeing ex-PM Rudd in a promo for The Tracey Grimshaw show … only it was Michael Chamberlain. The Rudd-Adams interview had me thinking of Dorothy Parker’s review of The House at Pooh Corner – “at which Tonstant Weader fwowed up.” Then Latham emerged from whichever sandpit he’s lurking in these days to fulfil some bizarre prophecy about Zombie Leaders Past. While posing as a journalist. Nooice. 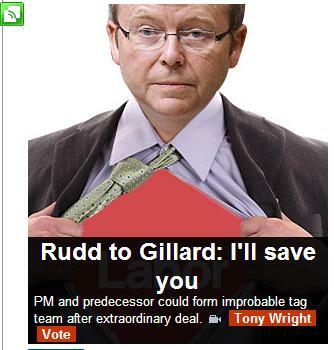 Oh dear god, how Rudd can be re-imagined as heroic in all this boggles the Hulk mind? More like sulky child offered an extra turn so their grizzling doesn’t ruin the party for everyone else.